(July 30, 2014) -- Meet Sierra Luna. This UTSA kinesiology major is on track to travel to Richmond, Canada, to compete in the inaugural TAFISA World Martial Arts Games in September as part of the U.S. Martial Arts (U.S.M.A.) team. Luna is one of only three athletes from Texas invited to join the team at the games and the only competitor from San Antonio. She is a 12-and-a-half-year practitioner of the Hayashi-Ha Shito-Ryu style of traditional Karate, which originated in Okinawa, Japan, a Third-Degree Black Belt, and a 10-year veteran of martial arts competitions across the country. "It's an absolute honor to be a part of these inaugural games," said Luna. "I hope I can do well and inspire a whole new generation of traditional martial arts practitioners in San Antonio." Luna tried out for the U.S.M.A. team after one of their representatives asked her to submit a video showcasing her karate forms and her proficiency with weapons. "I had no expectation of making the team, to be honest," said Luna. "I tried out only because they said they would give me critiques on my form. I;m always striving to improve, so that advice from such distinguished practitioners is invaluable." But, to her surprise, two weeks later, Luna received a letter asking for her uniform measurements and congratulating her on making the team. She has been training almost non-stop since, including a three-day training camp she will attend with her U.S.M.A teammates. At the games, she is registered to compete in three categories. 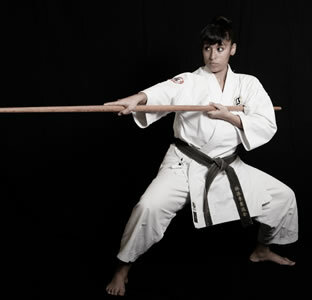 Two include the use of weapons such as her bo, a six-foot long wooden staff, and sai, a three-pronged baton commonly used in Okinawan martial arts. In her spare time, Luna works as karate instructor at a martial arts school and competes in tournaments all over the country. The martial arts, she said, has become an integral part of her life, and she enjoys aiding young kids in finding their passion for the Hayashi-Ha Shito-Ryu style. "I think it's important for young people to not only learn discipline and respect but to also feel as if they are a part of a loving, supportive community," said Luna. "Joining a martial art is a great way of finding that." Outside of martial arts, Luna works with a local nonprofit organization dedicated to fighting bias, bigotry and racism in order to create an inclusive community for young people. Luna's dream after graduation is to work for a local elementary school as a physical education teacher. She hopes to encourage children to find joy in active lifestyles. Do you know someone at UTSA who is achieving great things? Email us at social@utsa.edu, and we will consider your submission for an upcoming installment of Meet a Roadrunner. Read the stories of other UTSA students, faculty, staff and alumni on the Meet a Roadrunner website.